Moving is one of life's most stressful events, but it doesn't have to be. If you live in Mountain View moving boxes from ZippGo will take the stress out of your move. Place your order on our website or call and speak to one of our customer service staff and you can have your boxes delivered as soon as tomorrow. Skip the hassle of driving to a store, paying for overpriced cardboard boxes, and then dealing with the game of tetris trying to fit them in your car. 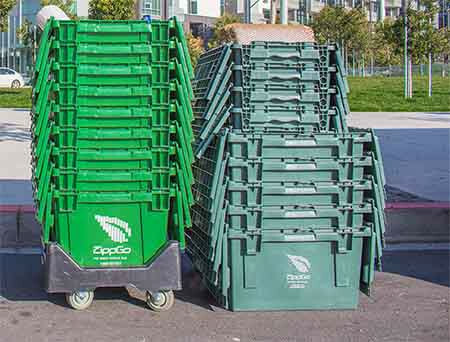 ZippGo's courteous and expert delivery staff will bring our innovative, cool green, and ready to be packed plastic boxes right to your door. Our boxes are delivered assembled and never need tape so you can start packing the moment they arrive. Additionally, we offer a full line of moving supplies Mountain View clients have found to be very useful during the move. 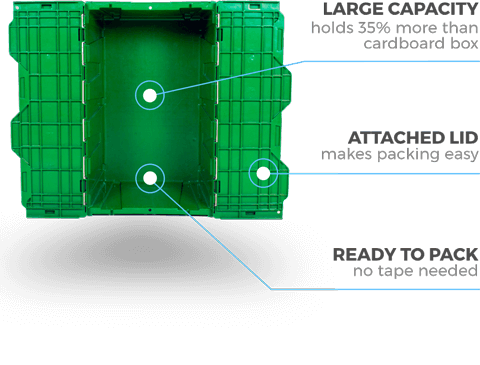 In addition to packing paper, greenwrap, bubblewrap, and plastic wardrobe boxes we also carry innovative patent pending products for safely and sustainably packing glasses, plates, and bowls. Our glass and dish divider inserts make packing kitchen items lightning fast while ensuring they arrive at your new home in one piece. We've been delivering our green moving boxes and moving supplies in Mountain View for over 7 years with consistent 5-star reviews on Yelp. 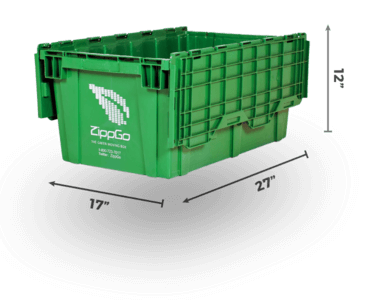 ZippGo moving boxes come in three different sizes so you can pack most of the small and large sized things in your Mountain View home. We completely thought about our customer's experience and specifically designed boxes to make your move as easy as possible. If you've got books, we've got a box for you. Our medium sized moving box was designed specifically to prevent overweight boxes, maximize packing efficiency, and to keep your movers safe (and happy!). 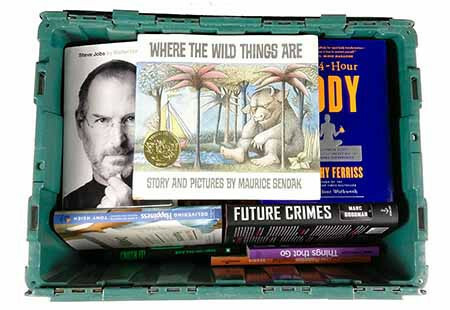 This moving box, AKA our book box, has a little over 2 cubic feet of storage space so you can fit enough books in there, but still keep it light enough so it's easy to lift into a moving truck. Our extra large sized moving box was designed to be longer and wider so our customers had a way to pack their blankets, pillows, and bedding and prevent them from getting dirty during the move. 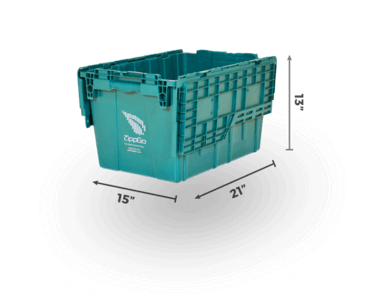 Our large sized moving box was designed for packing most of the items in your bedrooms, kitchen, and remaining living spaces. These are our all around boxes and make up a majority of the boxes you'll find in our box packages. Your belongings are valuable, and when you are moving in Mountain View you shouldn't take any chances by packing in cardboard moving boxes. We have found that when using cardboard moving boxes Mountain View residents often find ripped, damaged, and broken items once they unpack the moving boxes at their new home. 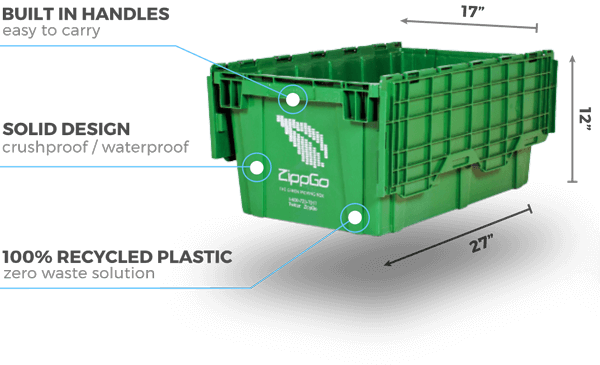 Since ZippGo's boxes are made from 100% recycled industrial plastic they are tear proof, crush proof, and water proof. The bottom will NOT fall out on our Mountain View moving boxes, so use every cubic inch of space and pack to the top without worrying. If you've packed in cardboard boxes in the past, you know they are essentially made of thick paper that will get soaked and soggy if it rains on your moving day. 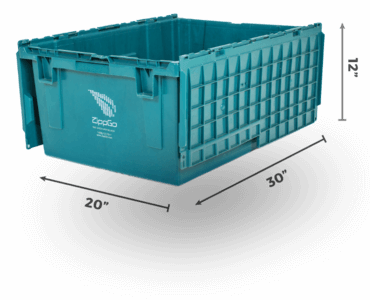 Since our green moving boxes are made of 100% recycled HDPE plastic and are waterproof, rain and moisture will simply drip off our boxes and your prized possessions inside will stay absolutely safe. "I'm OCD about cleanliness in my life, and moving boxes are no different. Cardboard boxes can often have dustiness even when new and if they are used can carry lots of dirt, bacteria, and I've read horror stories of bedbugs (gives me the shivers just thinking about it)! 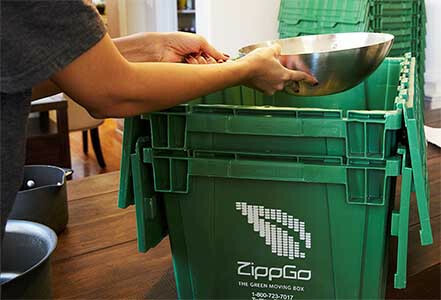 I was amazed how clean the Zippgo plastic boxes were when I received them and was one happy camper. Customer service was amazing and the 40 Boxes I ordered for my 2 bedroom was perfection! Love these guys! Would totally rock them again for the next time I move!" "I loved the convenience of getting these delivered to my door! Since I had to return them within 2 weeks I was forced to unpack vs. having my stuff sit in cardboard boxes for months. Thanks ZippGo!" "The entire experience from start to finish with this company was amazing! They delivered when they said they would, picked up the boxes when they said they would, and the boxes worked just as advertised. I'll never go back to cardboard boxes." Free Next Day Delivery in Mountain View!